last100 editor Steve O’Hear has been a big advocate of the so-called ultra-portable Netbook computer from Day One. Now we see others are just as interested. The specs continue: It will have Wi-Fi, maybe a USB port, a built-in battery, a half a gig of RAM, a 4 GB solid state hard drive. Its primary method of input is an iPhone-like touchscreen, it runs on the Linux operating system, and it uses Firefox as its browser. “The idea is to turn it on, bypass any desktop interface, and go directly to Firefox running in a modified Kiosk mode that effectively turns he browser into the operating system,” Arrington wrote. Add Google Gears for offline syncing of email, Google docs, and Skype for communication “and you have a machine that will be almost as useful as a desktop but cheaper and more portable than any laptop or tablet PC,” he wrote. The Arrington Plan, echoed by Nik Cubrilovic at TechCrunchIT, is to first create a marketing document to outline what the TechCrunch Tablet will do, then a small group of interested people will spec out the hardware. Volunteers also will help write customized Linux and Firefox code. Once the design is compete, the TechCrunch initiative will work with a supply chain to source the cost of the machine — Arrington’s goal is $200, Cubrilovic mentions $300 or less. Arrington hopes to build a few prototypes and, if everything works well, they’d open source the design and software for others to manufacture. “The goal is to keep the machine very simple and very cheap,” Arrington wrote. It’s a laudable goal, one that should be on the table at all the world’s major computer and telecommunications manufacturers, including Dell, HP, Samsung, LG, and others. But are any of the majors besides Apple working on this? Apple has already introduced the iPhone (which Arrington says has too small of a screen) and the super-thin (but expensive) MacBook Air. In addition to already available Netbooks, Nokia sells the N810 Internet tablet (see last100 review) for less than $500. There are a bunch of off-brand tablets from overseas (Sahara Slate) and (eo UMPC) and interest from technical organizations (maemo), consumers, (Firebox computer), and some manufacturers (ASUS). There are also products in the wings like Google’s mobile operating system Android. Ultimately, these all fail the Arrington surf-the-Web-from-the-couch test. 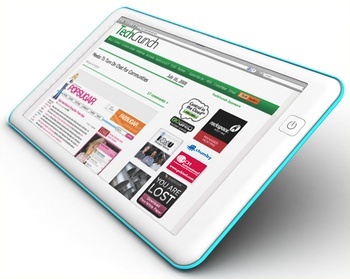 Whether the TechCrunch Tablet can actually be manufactured at a reasonable cost and quality remains to be seen. Nicolas Negroponte, a founder of One Laptop Per Child (OLPC), wanted to build an affordable educational device/computer for use in third world countries for about $100. So far that hasn’t happened. And coming from the world of product design and development, I know there’s all sorts of issues and stumbling blocks once you start delving into the actual hardware and UI design, engineering, parts sourcing, prototyping, manufacturing, and marketing. Suddenly that $200 goal looks more like $400, and what you get for $200 is crap that nobody would want. But Arrington can dream, can’t he? And who knows: Maybe Arrington is the most powerful person in tech and can move Dell, HP, and the other biggies into a market they should be already exploring.